US, 1979, 124 minutes, Colour. Tom Skerritt, Sigourney Weaver, Veronica Cartwright, Harry Dean Stanton, John Hurt, Ian Holm, Yaphet Kotto. Alien was first released in 1979 and made a strong impact with its focus on space horror ('in space no one can hear your scream') just two years after the release of Star Wars. Alien boasts excellent space-voyaging vehicles and effects seen in great technological detail. 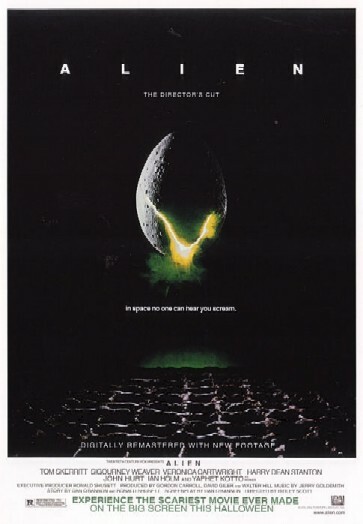 However, the plot is traditional horror, combining the Old Dark House, disappearing characters (a huge 7 crew spaceship has numerous eerie long corridors) and lurking monster (some ugly, scary touches and lots of ooze) and a gradually accelerating pace (after suspenseful slow tracking shots and ominous close-ups as the alien is searched for) until heroine Sigourney Weaver shows that the men, led by Tom Skerritt, don't have the monopoly on heroics. John Hurt and Ian Holm must have enjoyed themselves indulging in space horror, Holm as the android and Hurt with the famous monster exploding from his stomach.. Director Ridley Scott had made only commercials and The Duellists at this stage of his career. He went on to make some classics in other genres: Blade Runner, Thelma and Louise, Gladiator. This time he set out to scare and awe a vast audience and does. He worked on a Director's cut in 2003, improving the soundtrack and adding about five minutes of extra footage, mainly scenes which he had originally trimmed. 1. Interesting, enjoyable? Overall impact? A film of 1979: space exploration, technology? Space and horror combined? 2. The technical impact of the film: the visualising of space, space ships, the interior in such detail of the space ship? The visual presentation of life in space, the sounds? Colour, decor? The contribution of the score and its atmospherics? The foreign planet, the visualising of the alien, its variety of appearances, blood, ooze? The contribution of the special effects? 3. The pace of the film: the measured introduction, the transition to ordinary life of human beings, the extraordinary exploration, the slowing of the pace with the puzzling over the alien, the build up to suspense and the long, slow tracking shots and fear? The final speeding up with the chase, the hurry for the blasting off from the space ship and its explosion? The effects for shocks,, scares? The detail in close-ups and tracking shots for audience involvement? 4. The horror origins of the basic plot: the old dark house with its group of guests and dark corridors, the hidden monster and the sudden deaths, the elimination of the individuals. survival? Monster movies and stories? The red herrings, especially with the cat? The adaptation of horror conventions to the space trends of the '70s? 5. The importance of the space ship, the Nostromo and the overtones of Joseph Conrad? The audience knowing the space ship well, its various rooms, technologies, computers? The fact that it ultimately was destroyed? The space ship as the environment in space? The background of the commercial company, the multi-national and sinister background? The ordinary mission for oil refineries and the secret mission for getting the alien back to Earth? The irony of the computer's name as 'Mother' and the feminine voice? The hierarchy in the crew? The personalities, relationships? The substitution of a man by a robot and the control during the mission? The sinister aspects of such exploration? 6. The opening sequences and the introduction of the audience to the space ship? The ritual of waking up? The transition to the goodfellowship of the meals, the ordinary work, the haggling about money, contracts? Each character representing a type? Dallas as the strong American leader type, the making of decisions? Ripley and the Jane Fonda-tough woman of the '70s, strength, know-how, decisive? Lambert and her skills, her capacity for being afraid? Ashe as the science officer, impersonal, ultimately revealed as a robot? Kane as the ordinary man, the leader of exploration and the volunteer, the first victim? Brett and Parker as the collaborative workers, one black, one white? Brett and his comment, "Right" to everything? hiding, attacking, its attacking human beings and the audience responding like the crew to the presence of the alien? 8. Kane and the medical exploration, the ugliness of the alien and its acid blood? The transition to Kane's recovery, the meal and the sudden agony and the shock emerging of the parasite? The pathos of his burial in space? 9. The screenplay's attention to strategies, fears, the elaboration of machines to detect the alien, the long sequences of search? The focus on Brett and the long tracking sequences, the scares with the cat, his ultimately being overwhelmed by the alien? 10. Dallas and his leadership, courage, communication, final confrontation, all signalled by the computer with the approach of the alien? His being trapped and begging for death? 11. Ashe and his opening the door to let the alien in, his assistance with the medical examination, his sitting surveying in the pilot's seat, his clash with Ripley about the program? The confrontation and his being revealed as a robot, the ooze, the decapitation, the body, the plugging in of the head and his speaking from the floor, his final destruction? Audience response to Ashe as robot? 12. Lambert and Parker as surviving, planning to leave on the emergency ship? Their busyness? The confrontation with the alien, the menace to Lambert, the attack on Parker and their deaths? 13. The effect of Ripley being left alone? Her control, her rank in the hierarchy, her initial ordering the door not to be opened? Tough, feminine? Her fears, ability to think and manoeuvre? Her trying to interrogate Mother? Her decision to abandon the space ship, the detailed plans, the time element? The rescue of the cat, blast off and the exploding of the ship? The inevitability of the alien being aboard the second craft? Ripley's being relaxed, changing for hibernation, the confrontation by the alien, her getting into the space suit and her final strategies to eliminate the alien? The final tape and the completion of the mission? The choice of Ripley as the character to win and survive? 14. The appeal of science fiction, the imagination of science fantasy, anticipation of the future, anticipation of the present? The value of space exploration, fears, possibilities? Man and the confrontation of space, the group? The totalitarian and capitalistic use of people in the space future? 15. The appeal of horror films: scares, shock, the shadow side of the human spirit?